In picture books as in all illustration, the artist can use light source and shadow to create atmosphere, or even to add to the story. Complement this with my post on creating aerial perspective. Overlapping shadows tend to suggest the power of the objects that cast them over the objects they overlap. Nodelman offers as example Errol Le Cain’s clever use of shadow in Beauty And The Beast. In that book, the Beast has an unusually shaped shadow which overlaps the father’s foot. This tells the reader that the father is afraid of the Beast. That shadows can cause overlap effects suggests the importance of light sources for creating relative weight and focus. Not all pictures imply a source either inside or outside the picture for the light that illuminates the scene–books like Rosie’s Walk deliberately avoid any hint of darkness, and everything is bathed in the same even, cheerful light. But pictures that do imply a light source focus our attention on the objects in the light–and, if it is depicted in the picture, the light source itself. Other illustrators include highly idiosyncratic shadow in their illustrations. Below is an example from Wolves In The Walls. The light above the door highlights the text without even seeming to. The light coming from the TV should really be casting a different sort of shadow from the boy lying on the floor (the shadow should be cast behind him rather than in front) and the girl, who is emotionally distant from this otherwise cosy scene, casts no shadow whatsoever. The colours are warm and this could easily be a cosy living room scene, but the shadows at the edge of this room combine with the off-kilter perspective to create an uneasy atmosphere. The light implied by pictures may come from sources both inside and outside the pictures. Like the bright lamps often seen in Nijinsky, an actual light source depicted in a picture draws attention both to itself and to what it casts light on. For example, each of the lamps in the scene of a theoretically happy family evening nevertheless lights only one of the Nijinsky children, and so implies their isolation from one another. The light that shines onto Brian’s face from an unseen but implied sun as he peers through a window in The Salamander Room emphasizes the way in which the window itself, its borders jutting out from the rest of the picture like a jet taking off, offers an opening into the bright and free world outside. An implied light from the rear of a picture places characters in front of it in shadow, and Human takes advantage of this to place the evil brothers in shadow throughout The Water of Life; but when the good brother first meets the dwarf, the light comes from the front and illuminates his face. Viewers expect light to fall from above, and therefore variations from this convention, such as those Van Allsburg uses in The Polar Express and M.P. Robertson uses in The Egg, create an atmosphere of strange mystery. Again, heavy use is made of shadow, though we can’t see — or even guess — at any light source. The light seems to be coming out of the opaque wall. The reader senses that there’s something inside the wall (aided, of course, by the huge clue in the title.) The light sources throughout this book are unknown and illogical, but also foreshadow the story. The reader doesn’t know what’s about to happen but we feel appropriately uneasy. Gyorgy Kepes [Hungarian artist and art theorist] suggests that we expect light to fall from above, so “every shift from this standard light condition is registered and interpreted by us as an exaggeration of spatial dimensions”. 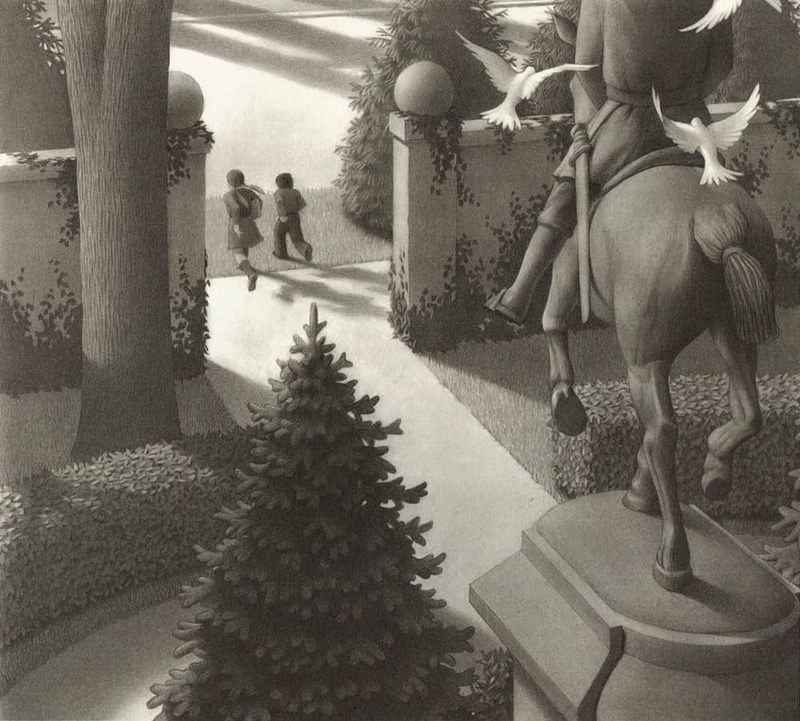 InIn The Garden of Abdul Gasazi, Van Allsburg switches the light source on each page. Occlusion always creates visual tension. What is occlusion anyway, when we’re talking about art, and not dentistry or meteorology? Occlusion is rarely discussed as a major issue in art, yet it could be regarded as the major issue in depicting a three-dimensional scene on a picture plane. By occlusion is meant that in any view of a scene some surfaces are hidden in part by nearer surfaces. First, what is a metonym? A metonym is a part that stands in for the whole. In picture book illustrations, sometimes we see an image of a part and this, too, is meant to stand in for the whole. When does an illustrator show the whole thing and when to show only a part? The inclusion of a head with facial expression imparts more meaning, of course, than if you’re only showing a shadow. This choice is all to do with focalisation: What does the illustrator tell the reader to look at? But what else must we notice about the picture? Inclusion of someone’s shadow shows that although that character was there before, now they have gone. This cuts out the need for an interstitial image showing the character actually leaving. Similarly, a verbal description of a character as an attractive young Australian girl with a healthy tan commits more meaning than one describing her simply as a girl. 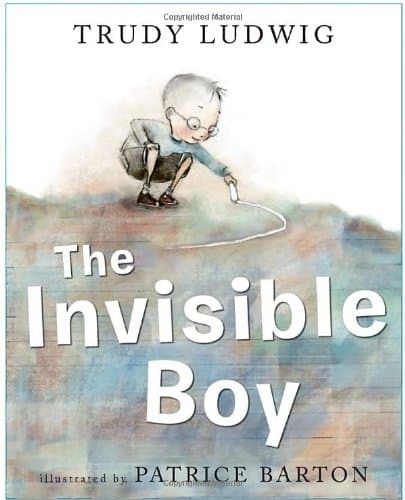 A trick sometimes utilised in picture books is seen in the two images below, in which the shadow cast differs from the person/object casting the shadow. It’s generally used for ominous effect, but could also be comical. I use it in our picture book app Midnight Feast to show how the main character is angry at being sent back to bed. Ah, composition. How things are arranged on the page… or on the screen. 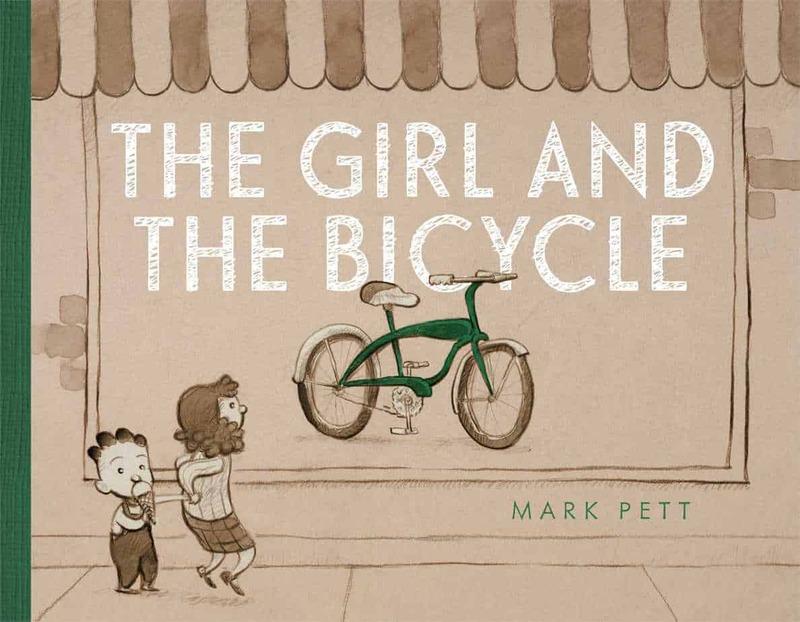 I have written before about how picture books have a lot in common with film, and that study of one equals study of the other. Knowing how to manipulate an audience is far more important than knowing how to manipulate the technology of film. Here is a useful YouTube video from Channel Criswell which introduces the topic of Composition in Storytelling. 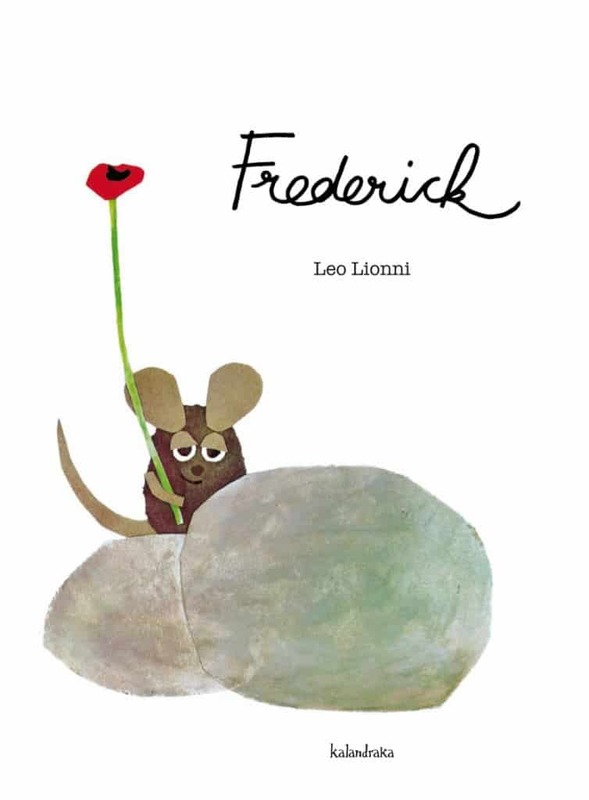 While the examples in the video are all from film, as I watch I’m thinking of the page composition of my favourite picture books. It draws your attention to the right thing. There is a subtext. e.g. Which character has control of the scene? How are they feeling? How have they changed? What are they about to do? Harry and Hopper are shown from above to highlight how powerless they are — death is coming and there’s nothing they, or anyone else, can do about it. This illustration of The Railway Children by Ji-hyuk Kim emphasises the powerlessness of the girl. PRIMAL CONTROL: What subject holds more weight in the narrative at that moment in time? This could show the power dynamic between characters or even between character and setting. Nothing shows this more than size and scale in an image. 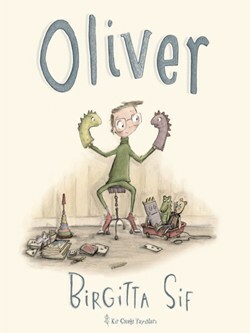 Here, Oliver Jeffers has given the father artificial control, but the Book Eating Boy has the primal control. In Rules of Summer, Shaun Tan gives the umpire the artificial control but primal control belongs to that weird whatzathing. Control can also be conveyed by placing the subject right in the centre of the frame, though it can also mean loneliness and difference, as below. This boy is the only one at school feeling sad. 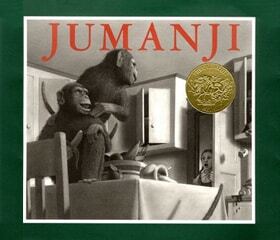 This is an aspect of composition which is perhaps talked about even more in picturebooks than it is in film. What is the purpose of negative space? It is often used to show the vast expanse of the area. On a psychological level, negative space creates apprehension, as we expect something to take place in the void we see. In characterisation, negative space can be used to show that characters have no hope. Or perhaps it signifies the great distances characters must go before reaching their goals. This story by Oliver Jeffers is all about loss. The first page of the app, seen here, gives the ominous feeling that loss is about to happen, using the technique of negative space. Oliver Jeffers makes much use of negative space. Here it is in The Incredible Book Eating Boy. In this case, it precedes the climax, as you can tell from the accompanying text. Where words accompany the scenes the words feel more integrated with the illustration when the illustration is decontextualised, probably because there’s no clear demarcation between the edge of the picture and the start of the words. 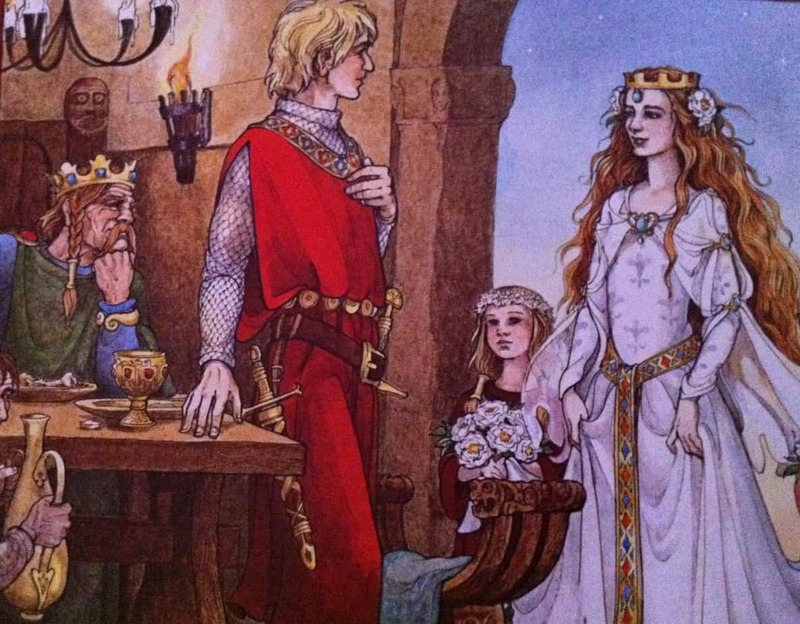 When an illustration extends right to the edge of the page it is called an ‘unbound’ image. This is an unnecessary term when it comes to film, since almost all frames in a film extend to the edge of the border. 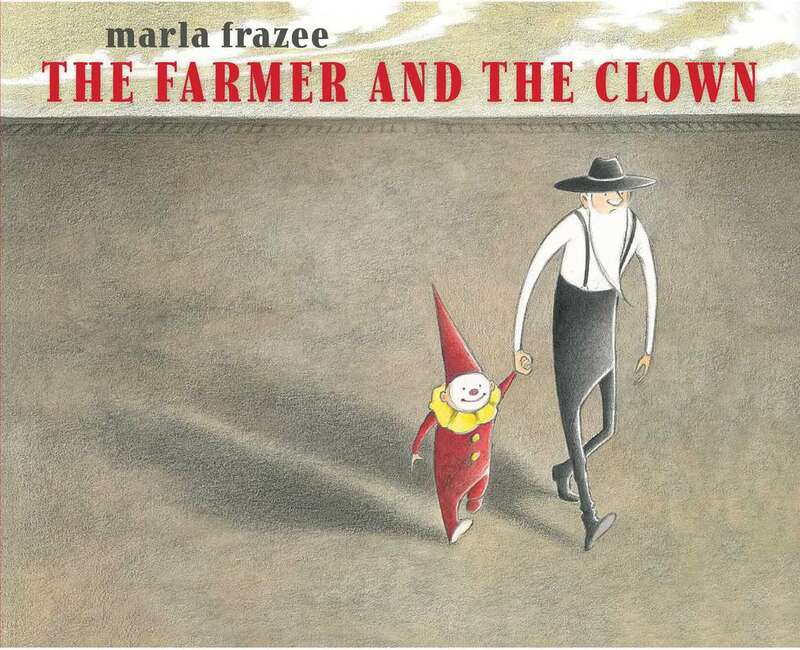 Many picture books are composed entirely of unbound images. In these stories the imaginative world becomes the focus of the story throughout. 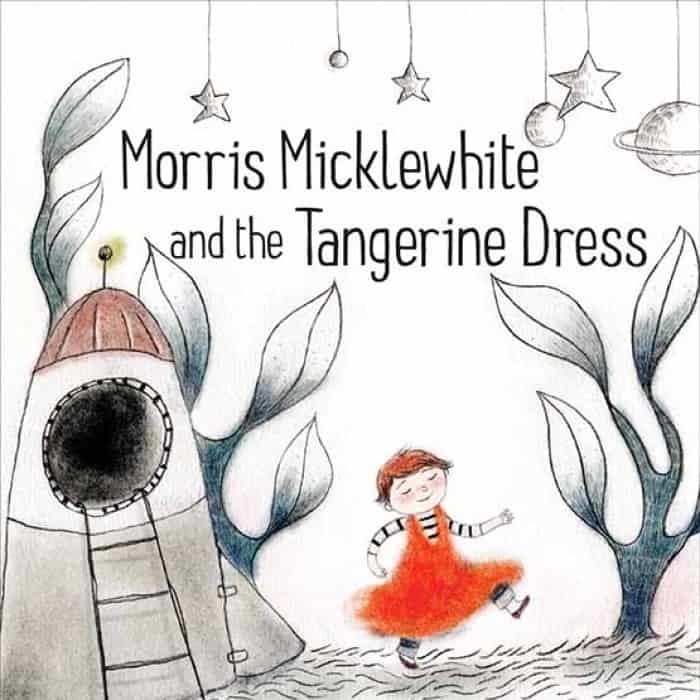 If the illustrator is creating an otherworld or a work of magical realism or something that is not entirely familiar to readers (as are bathrooms/kitchens/bedrooms etc.) then you’ll likely find mostly or entirely unbound images. It’s also possible to have both unbound and decontextualised images i.e. unbound images can still have a heap of white space. I Went Walking is made entirely of this kind of image. But in a large number of picture books you’ll find a mixture of bound and unbound images. When to make use of which? Bound images are those which are set within a page margin or border, demarcate the story world as more distinctly separated from the reader’s world than unbound ones and may also serve to ‘contain’ or confine the character. In general, bound images separate the reader from the semiotic world of the story. Where there is both a frame and a margin, there’s a more emphatic demarcation of the two. Frames contribute to the ambience of a layout. A defined frame marks out the image as a representation to be viewed from the outside but can also afford additional meaning. A frame can either influence the attitude of the reader, or confer a symbolic attribute upon the character(s). The frame doesn’t need to surround the entire picture — it might just be on one side. This binds the picture less. 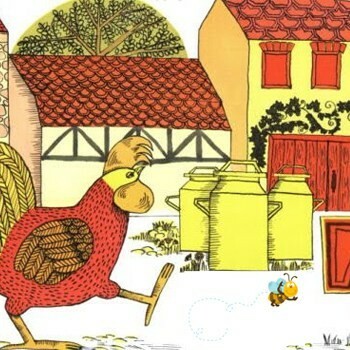 A part of the illustration might extend out into the frame, for example a character might sit inside the framing block of colour thinking, to show that the main image on the page is part of a flashback. The frame might be part of the picture itself, e.g. in Voices in the Park the playground the children swing from itself forms a frame. This is called ‘an experiential frame’, and the frame serves as a symbolic attribute. The playground as frame shows that the young characters are playful. Notice the very clear shape which guides the composition. Human beings are prone to find order where there may be none, and frames in cinema work to help the elements to appear in a much more uniformed manner. They tend to dilute the external details in an image, and our eyes are drawn to them because within the frame lies order, and hopefully, our main subject. But through this technique emerges deeper implications. These frames are often used as a partition to separate. The subtext: Why not use the frame to separate the worlds on both sides of the frame. It can show a contrast as simple as freedom versus isolation, or by showing a character’s passing through a frame, we see their decision to pursue a lifestyle, contrasted to those lifestyles that other characters are denied entry to. 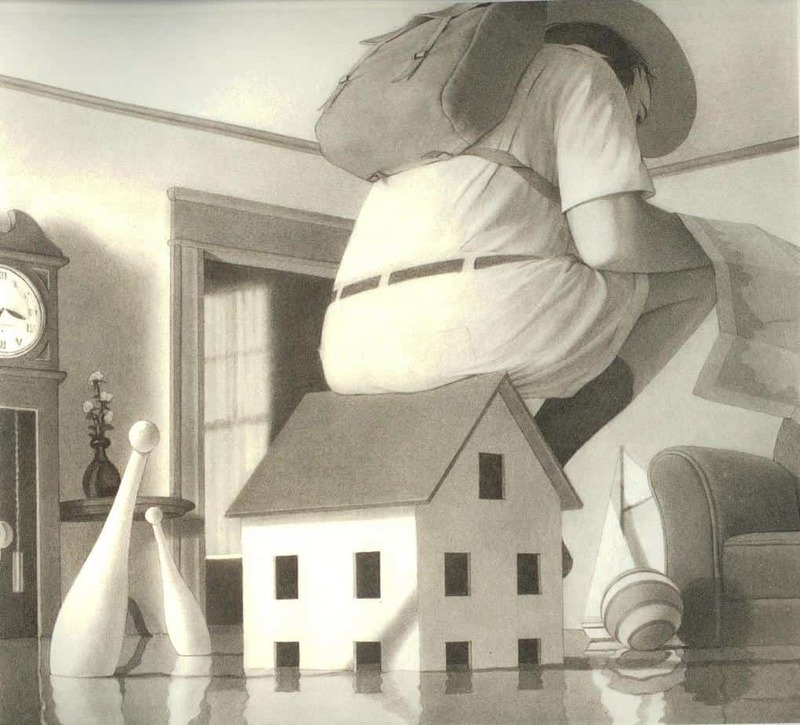 You’ll find a lot of windows in picturebooks, though the meanings and metaphors vary. This window is a portal to ‘the other side’, the unknown, to the psychological state of grief. Harry inside the room with the father hovering outside the door frame shows their psychological disconnectedness. Nothing the father can say will bring Hopper back. Harry must endure this grief alone, as we all must. Not all frames look like frames. Doors and windows and mirrors are obviously ‘framed’. But we can also see a character through the barrel of a shot gun or a noose or two hands, through legs, books in a library, or any number of other objects. In the image below, the symmetry suggested by the architecture and the centre position of the tutor is juxtaposed with the children, who are lively and cannot be tamed. The main character is framed by a door. Jon Klassen makes much use of shadow as a framing tool. Here the shadow is cast according to an open door. Even a bucket can act as a frame. A cardboard box can have its own window. Billy Twitters and the Blue Whale has some very interesting examples of framing. Here, the main character is framed by a whale’s mouth, as he enters the ‘portal’ of personal space. In fact, Billy Twitters and the Blue Whale open with this image. The mother is about to invade Billy’s space by telling him to clean up his room, and so the story begins. In The Highway Rat, another framing device is used, again to signify a portal to a different kind of world. One thing that is specific to film (and not to static images of picture books is ‘reframing’ (as demonstrated in the video). However, book apps are able to make use of this technique. I haven’t seen it done nearly enough (yet) but, on a touch screen device, finger gestures are able to take readers off screen to reveal something that wasn’t there before. 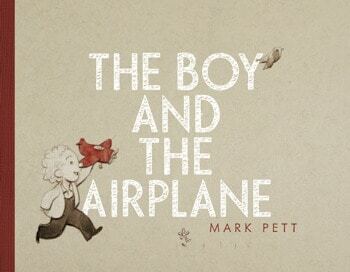 One example of this occurs in The Heart And The Bottle app by Oliver Jeffers. This is the main frame of one of the pages. If you pull to the right, the left part of the page appears, which has the double function of showing negative space while allowing for pop-up images upon tapping. What are the characters looking at? Whatever they’re looking you’ll want to look, too. Oliver Jeffers emphasises the eye-line with a dashed line. Parallel lines and converging lines can intersect characters or trap them in corners. The intersecting lines of the room as well as the shadows of the table and chairs seem to trap the Incredible Book Eating Boy behind bars. In the illustration below, Jon Klassen emphasises the way the characters lean back by framing them with architecture in the background. Cameras are able to pull focus to highlight the subject of a frame, in the way of an SLR camera. 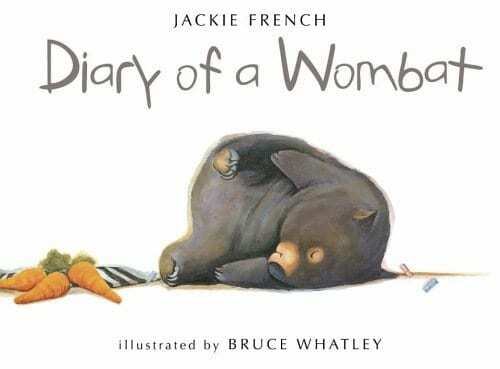 Picturebooks are more like point-and-shoots in that they typically tend to focus everything in the frame, by the very fact that there is no camera involved in the process. 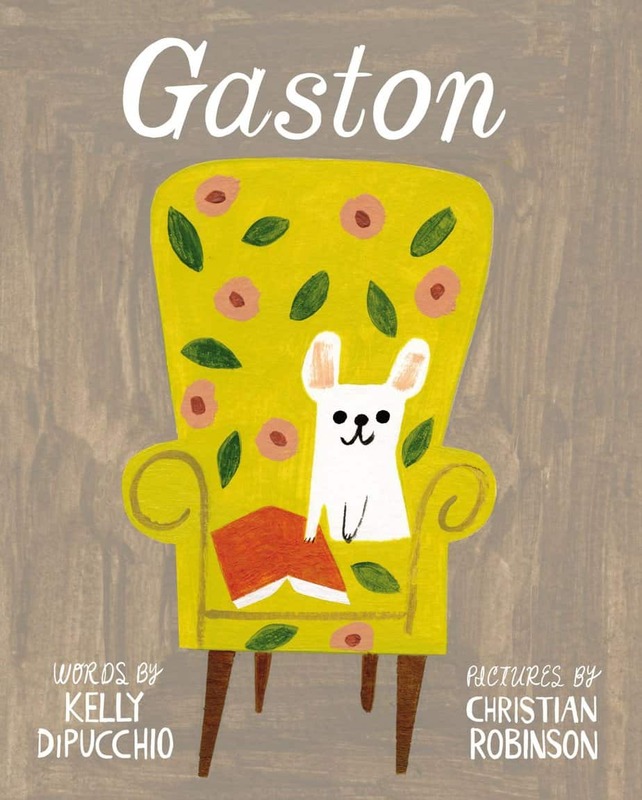 However, picture book illustrators can still mimic this technique. Illustrators have for a long time mimicked the human eye, if not the exaggerated pull-focus of cameras, by using the rules of aerial perspective. Closer objects are also more detailed, but what about when they are not? 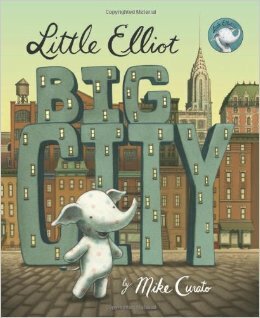 Some illustrators of picture books create work which is equally detailed no matter how far the object from the eye of the viewer. This may be because they are creating a folkart feeling, which goes hand-in-hand with light and bright stories. Rosie’s Walk is one such example. Here we have two compositional techniques to show ‘enlightenment’ that comes from books: The open door and the subject bathed in light. Alfred Hitchcock had a rule in which the size of the subject within a frame was in direct proportion to their importance at that point in the story. In Rules Of Summer, Shaun Tan plays with scale a lot to lend a sense of foreboding. This ‘part A’ image in Rules of Summer will be followed by a similar image but next time there will be something surprising where the lines currently converge. This is a less ominous example which shows just how many books there are in the library. “The Wrysons” is interesting as a study of writing technique because it is a story with the theme of ‘lack’ running throughout, and Cheever masterfully chose to employ some narrative techniques which are themselves about describing not what did happen but what didn’t, and what might have. A Lady Baltimore cake — created for genteel tea parties. 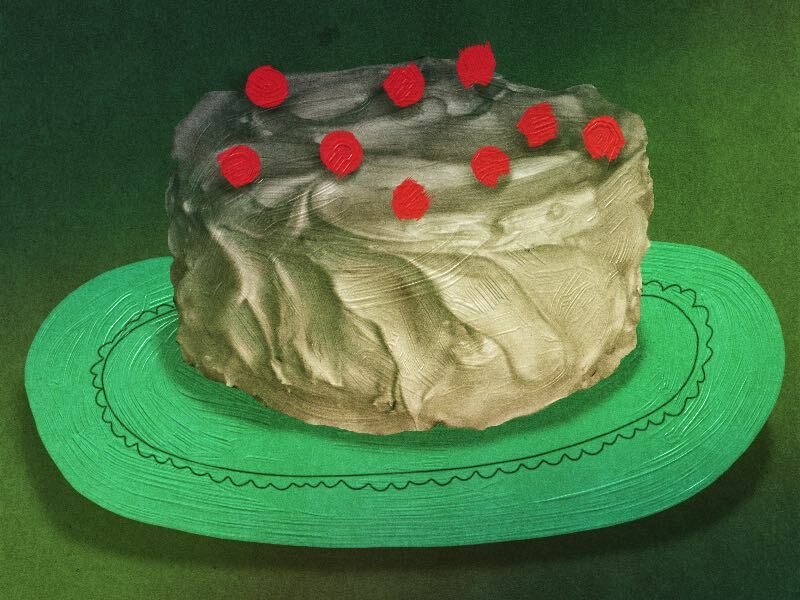 Novelist Owen Wister made this cake famous in his 1906 romance, Lady Baltimore. Apart from The Bella Lingua, which is set in Italy, this and the preceding number of Cheever’s short stories were all set in his famous Shady Hill. Did Cheever want to live in a place such as Shady Hill? I suspect he would have called the whole place ‘phony’, and in The Wrysons he once again dips into the idea that in the suburbs where everything seems perfect, there must be rot beneath the veneer. In fact, he has gone much further with this in other stories such as The Housebreaker of Shady Hill, in which a man burgles his own neighbours (I guess I didn’t really spoil anything for anyone there — it’s all in the title! ), and in “The Enormous Radio”, which is not set in the suburbs but is all about the feeling that you’re living two steps away from terrible, terrible happenings. A suburban couple with one daughter have zero interests except the wish for their comfortable suburb to stay exactly the same. The only difficult thing about the wife’s life seems to be her regular unsettling dreams in which someone explodes a hydrogen bomb and causes the end of the world. She also dreams that she poisons her own daughter. The husband thought he felt nothing when his mother died, but deals with her death by occasionally waking in the middle of the night and baking a cake in the kitchen to remind him of his childhood, in which his mother and he would bake together to create a cosy atmosphere. The husband is unaware of his wife’s dreams; the wife is unaware of her husband’s cake-baking habit, until one night he burns the cake, wakes her up, and they go back to bed more confused about the world than ever. 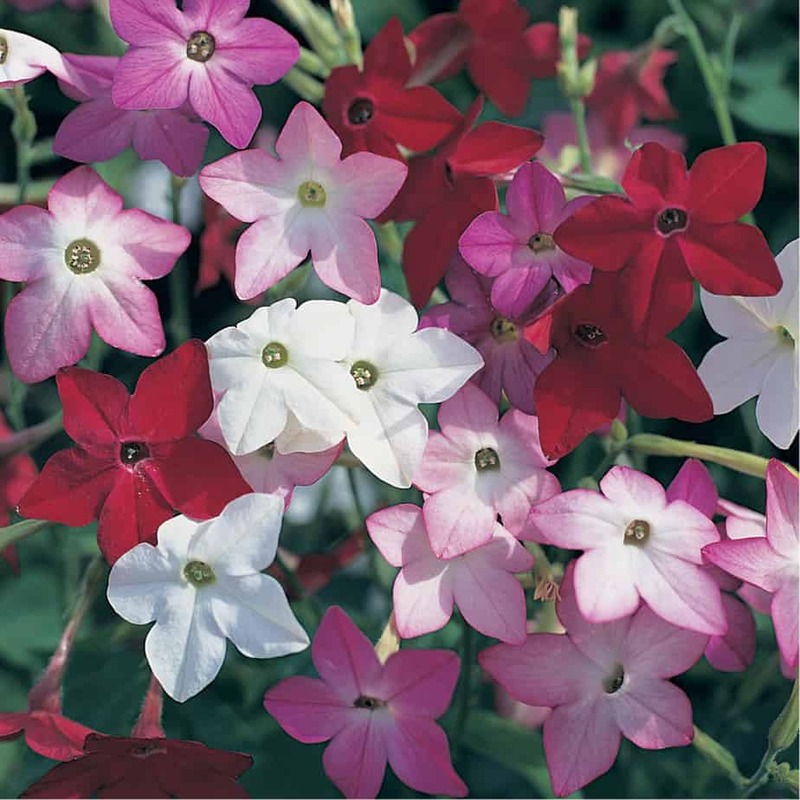 Nicotiana grows in the Wrysons’ garden. If you’ve read other, better-known stories of Cheever you’ll be familiar with this place in middle to upper-class America — it’s not a real suburb in any real town, but Cheever returns to it as a setting time and again. Perhaps his most famous story set in Shady Hill is The Swimmer. This family lives in the fictional Alewives Lane. They have a nice garden. ‘They were odd, of course’, writes Cheever — and with a masterly use of ‘of course’ we are to take it for granted that everyone who might seem ‘normal’ is actually harboring a hidden or overt eccentricity. It’s significant in this story that at the time this story was written, the baking of cakes in the home was strictly a feminine task, a point of pride, in fact, and for a married man to don an apron and make a cake — a Lady Baltimore cake, no less — would have been thought terrible emasculating. Indeed, when the wife is finally woken by the smell of burning, she admonishes the husband by telling him he should have woken her if he was feeling hungry, as if the kitchen was her own private space. This is also a time — difficult for those of us who are younger to imagine — in which people genuinely feared a hydrogen bomb ending everything. John Cheever isn’t exactly well-known for his ability to get inside women’s heads and depict the other half of humanity as fully human. If he wrote a story with a rounded female protagonist, I’m yet to read it. In “The Pot Of Gold”, at least, the main male character has something to learn from his wife. This short story demonstrates that even if Cheever didn’t feel he understood women sufficiently to be able to write from a female perspective, he at least grasped the essence of white male privilege of 1930s New York. John Cheever demonstrates a complex understanding of what money, or the pursuit of it, can do to the psyche. Though there are many stories and folktales about the evil of money, the messages here are a little more nuanced. In depression era New York, a young married couple feel that they live on the edge of poverty. In fact, they have enough money to afford an apartment and to go out to dinner on special occasions. But the husband is constantly after a get-rich fix, and spends a lot of money in this pursuit. When he goes off to war, the wife does quite well on her own with their daughter, having temporarily gone back to work. But when he returns, it’s back to high expenditures. Eventually, the husband gets a lucky break. His uncle has saved a man’s life on Lake Eyrie, and through this connection, the husband is offered a very well paid job in California. 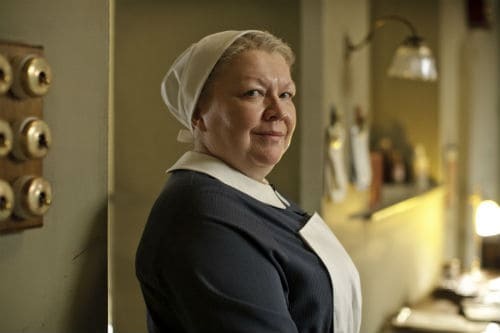 The idea of a strange, perhaps untrustworthy housemaid is particularly discomfiting to a middle class who can afford such luxury; we hate to think that we invite our own evil into our comfortable homes. An untrustworthy woman let into the home is a familiar trope in horror stories, and is the basis of Mavis Gallant’s short story “Bernadette”. Sometimes the trope isn’t used in the horror genre, but to lend a bit of horror to a different kind of story. 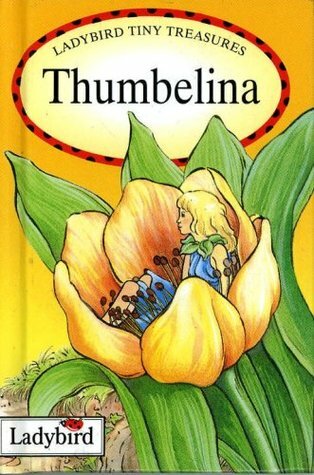 The reader of Mavis Gallant’s story Bernadette is lead to wonder, what is wrong with this girl and is she about to do something terrible? In fact, the housemaid of this story is simply a magnifying glass into the evil which existed in the house before her arrival.